"Cut The Rope" and "Pudding Monsters": Episode 18 (Disco Era) of Om Nom Stories and NEW Disco Era Update for "Cut The Rope: Time Travel" ver. 1.1 ! 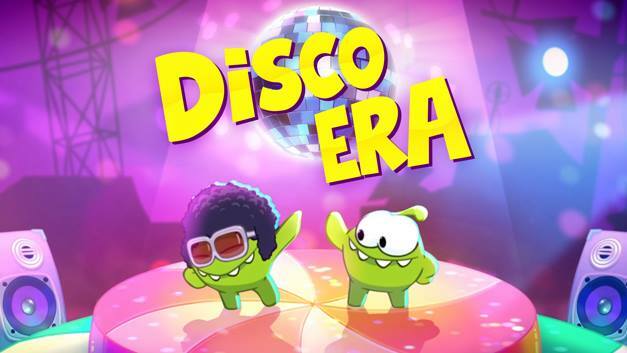 Episode 18 (Disco Era) of Om Nom Stories and NEW Disco Era Update for "Cut The Rope: Time Travel" ver. 1.1 ! The "hidden star" in this episode is easy to find but if you cannot find it, you can view the Answers page. This is also Puzzle No. 20 in the Puzzles page. A NEW device "disco ball" has been introduced which can block the laser beams and prevent them from destroying the candy.